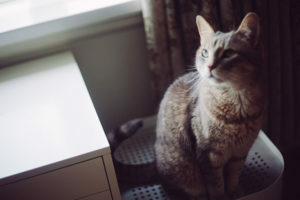 When I first got the Petsafe FroliCat Bolt, I honestly didn’t think Avery would take to it. He’s a very picky fella, is so incredibly lazy, and it takes a lot for me to engage him in playtime myself, let alone for an automatic toy to do this on its own. It’s a rare and mysterious thing for him to like any toy I bring him, and he’s never been a fan of playing by himself before. It took me years of deliberation, but last year I finally snapped, adding the FroliCat Bolt to cart. Avery was a fan of lasers when we first got him, then lost his taste for them a few months in when he discovered it was me behind the laser’s strange movements (how did I know he’d clued in? He wouldn’t stop staring at my face instead of the laser point on the ground whenever I pulled the silly thing out!). It’s been years since then, but the apathy he had toward lasers in his youth led me to conclude something like the Bolt wouldn’t be warmly welcomed by him. 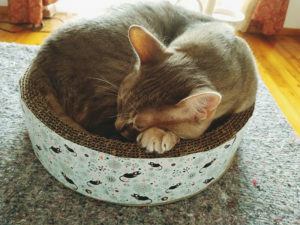 I thought, like all too many cat toys that have a permanent residence in my cat toy drawer, that he’d completely ignore it from the second I brought it home. That being said, I still held out hope Avery would take to an automatic laser toy like this one since they’re so stinkin’ convenient. I’m often just in the middle of something when Avery finally decides he wants to play, and a set-it-and-forget-it type toy like this is perfect for situations like those. Eventually, my hope that maybe he’d like it a little combined with the fact that the Frolicat Bolt is such a reasonable price wore me down and I finally gave up fighting the purchase. I figured it was time to stop wondering and just give the darn thing a shot to see once and for all if he might like it. Well he did like it, and still does to this day – a few months after I first made the purchase. I can’t stress enough that this is a really rare occurrence in my household. 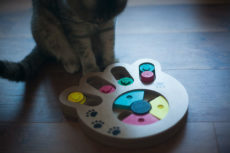 Avery doesn’t usually give toys a shot at all, let alone continue to like them past the initial first-day introduction. The fact that he’s continued to engage with the Bolt for months on end is a really good sign for me. Avery likes this toy as much as he can like a cat toy. 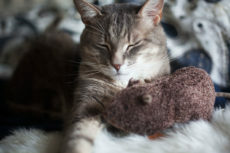 If it goes out, there’s about a 60% chance he’ll engage with the laser light on the ground at least once or twice, and for him that’s a top score for a cat toy (the absolute highest score to date going to the Petlinks Jeepers Creepers Rat, which I reviewed here). Obviously, I’m hoping his liking to the toy sticks for eternity (unlike the cat springs), but only time will tell. Either way, I don’t over-use this toy on purpose, and am on the conservative side with regards to how often it’s out. Once a week – twice maximum, just to be sure Avery doesn’t get bored having it available too often. How long will he play with it when it’s out? Honestly, not all that long, but he’s one of those oddballs who needs little to no time spent in actual play/hunting-mode (meaning I give him daily workouts amongst other things to keep him fit and well-exercised). I’d say the Bolt stays out for 10-20 minutes tops. In that time he’ll play with it, take breaks, play with it again, and over time – finally become bored and stop showing any interest at all. I know he’s done when he doesn’t even bother to follow the laser light with his eyes. What I love about this toy? It’s really convenient, turns off after a set amount of time so you don’t have to worry about ignoring it and having the battery run out on you, and it’s pretty durable. For the months I’ve had it, I’ve literally never had to replace or recharge the batteries once. It’s the kind of toy that Avery can knock over (which he has done quite a number of times) and I genuinely won’t care. It’s resilient enough to take the tumble, not heavy enough to damage anything in its wake, and it’s of course easy for him to meow at me to let me know when it’s fallen over (which he does) so I can hop over to the Bolt and plop it back upright. 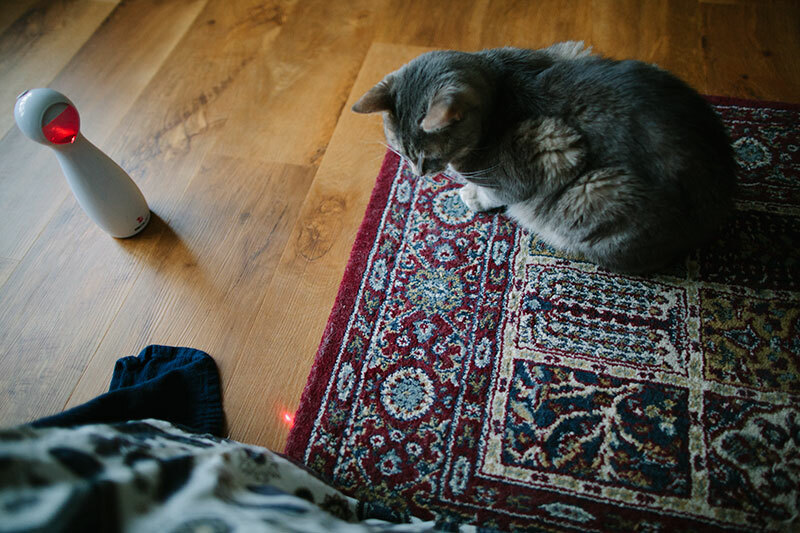 I usually set it so that the laser is on the corner of our long rug, facing in, as Avery likes the grip he gets from holding onto the rug to “catch” the light. I’ll also angle it at times so the laser ends up running from the floor to a dresser, so there’s more of a challenge element. Other times, I’ll just have it go as far as it can, across the length of the laminate flooring we have, and then put a little bath mat in the middle cause that somehow keeps him interested. Either way, the fact that it’s so easy to pick up and move definitely helps with keeping the interest going for Avery, I think. Things that aren’t so great about the Bolt? 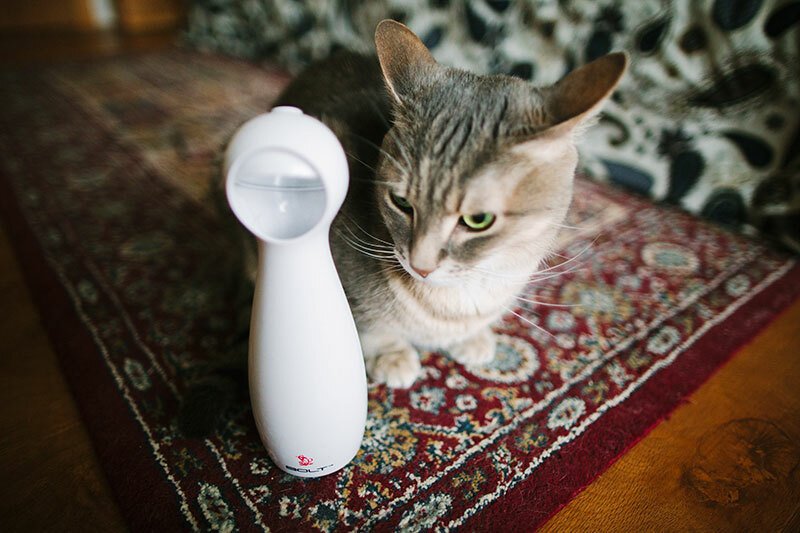 Some worry about cats looking directly at the laser and becoming blind. Luckily, I haven’t had to worry about this issue because Avery only ever looks at the floor or the furniture the light has bounced onto when the Bolt’s on. Even then, he ignores the laser light darting around over half the time – like I said, lazy. I’ve never seen him look directly at the Bolt when it’s on in months of use. 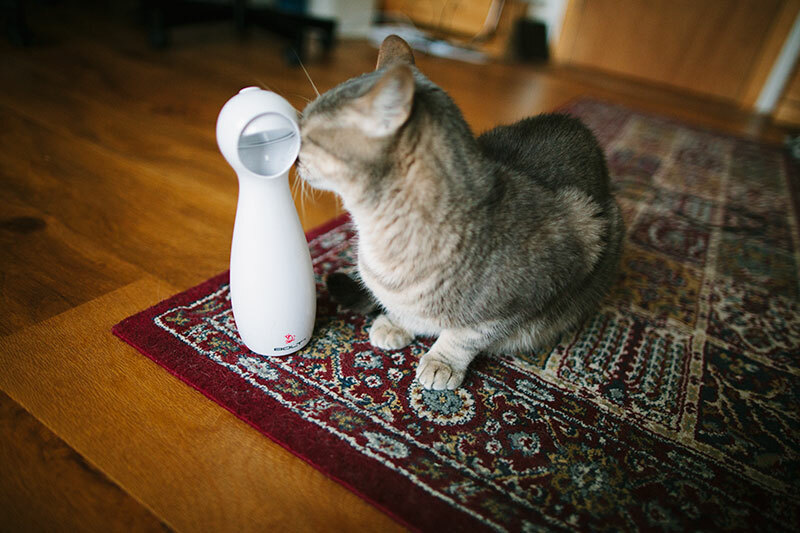 If you’re worried your cat might be an avid looker at the source of light, apparently this issue is completely resolved with the bigger, better version of the Bolt – the Frolicat Dart, so you might want to consider opting for that version instead of this one. Another thing that can be annoying – if you put the Bolt on the “closest” setting (you can adjust the distance the laser will travel to an extent, from short to long range), the laser light basically shines on the inside of the toy, getting “caught” so to speak inside the plastic for part of the movement rotation, and not shining the laser on the floor where it should be. This, I honestly don’t mind. I make sure the laser is slightly further out from the closest setting, and it’s all good. Also, since Avery doesn’t go for the laser the whole time it’s on, if/when the light does disappear for a second, then reappears, he’s genuinely not one to care. 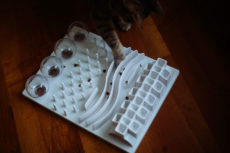 If you have a cat that hates predictable repetitive motions, this might not be too interesting for him or her. Though of course you can do what I do and move where you place the FroliCat Bolt to keep things more interesting. I thought the predictability of the movement would be a factor in making Avery not care for the toy over time, but so far so good, as long as I make sure to only pull it out infrequently, not daily. 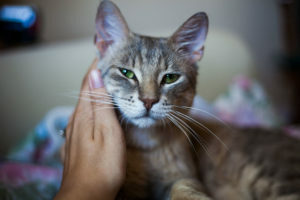 Again, the Dart is supposed to be substantially better in this regard, as it has less predictable motions and more settings when it comes to speeds to keep your cat engaged. So if you’re sure your cat will like an automatic laser toy, but aren’t sure which one to go for, I’d advise going immediately for the Dart if you don’t mind the price difference. I personally tried the Bolt first because I wasn’t sure if Avery would like the concept of an automatic laser toy to begin with, and didn’t want to spend more money than necessary on an automatic laser toy before giving this type of toy in general a go with him. Now that I have my hands on the Bolt, I might wait until I move to a house and adopt a second cat, then I think I’ll give the Dart Duo a try, since it’s perfect for multi-cat/multi-pet households (apparently dogs sometimes like these, too? Who’da thunk?). 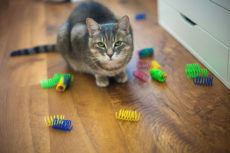 My end goal is to find as many set-and-forget interactive cat toys Avery will engage with as possible. They’re not as ideal as cat toys Avery can play with completely on his own, but they do come in handy when I’m busy, he gets a burst of energy, and I just can’t help him play. 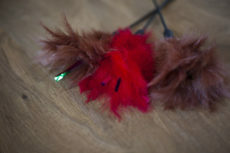 If I found around 3-4 interactive cat toys Avery loved using for those instances, I’d be really happy. At that point, I wouldn’t be worried about him getting bored of a specific one, since I’d rotate them regularly in an attempt to keep him as interested in each toy as possible. Would I recommend the FroliCat Bolt? Yes, I most certainly would. 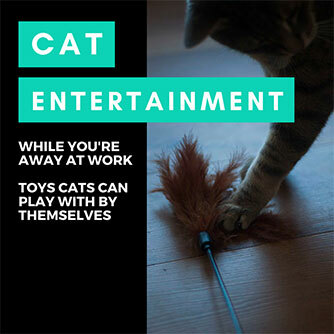 If you’re not sure if your cat will be into this kind of toy, I’d recommend buying it to try before spending extra on the Dart, but if you have at least one cat who you know loves lasers, I’d ignore this step and opt to buy the Dart instead, or for multi-cat households, save up and just get the Duo from the start. Again, the only reason I bothered to buy the cheapest version of this toy is because I had little faith Avery would use it. 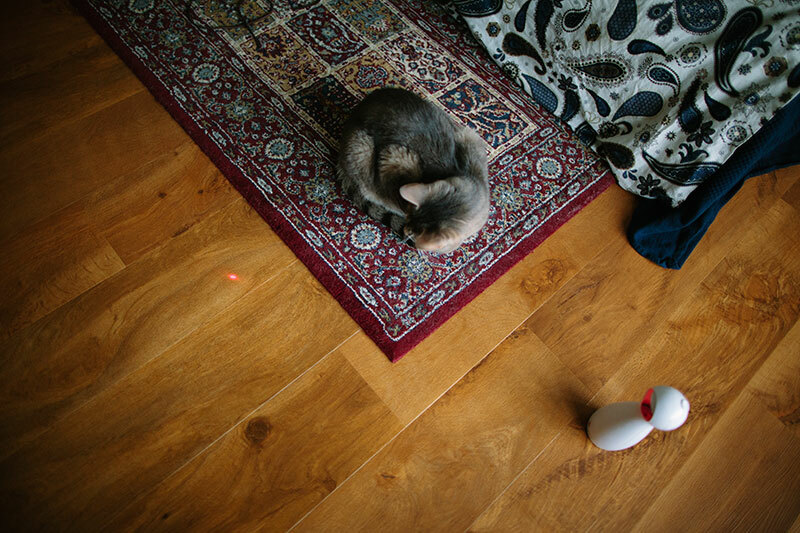 If I’d known he’d actually engage with an automatic laser toy, I wouldn’t have bothered with the cheaper version since the other versions actually seem to be huge upgrades with regards to increased settings for engaging cats, and since they’re less risky when it comes to lasers-in-the-eye than the Bolt. 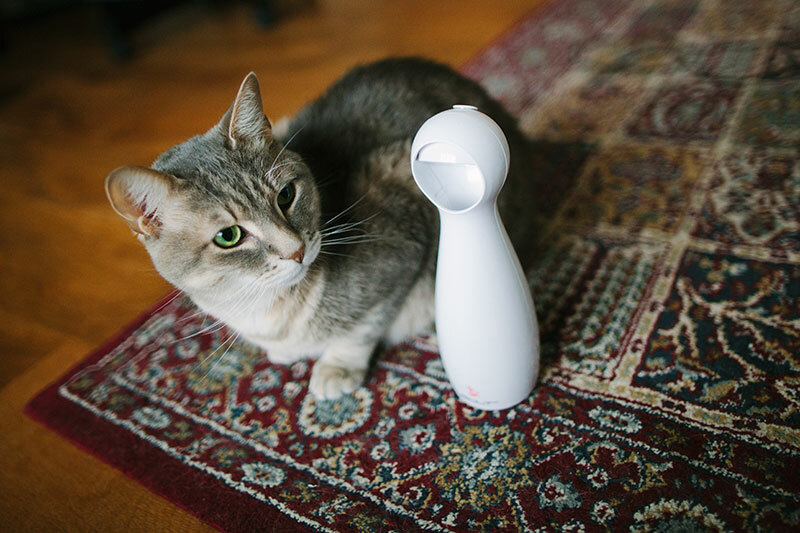 Is the Frolicat Bolt the kind of toy you can pull out and use daily? Probably not. That’s probably the quickest way to get your cat sick of this toy and never wanting to play with it again. 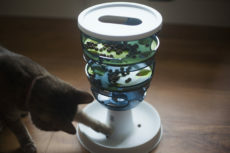 But for once or twice a week use, and in a rotation of a few different well-liked interactive cat toys, I think it’s a solid bet, and I’m happy to have it in my cat toy arsenal. I mentioned your blog and put the link in my post so others can visit and get the same opportunities as I do. Happy new year. 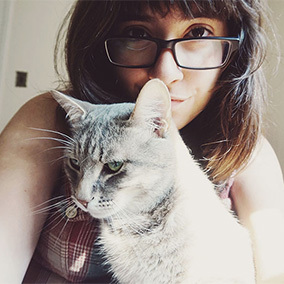 Was always curious about those – glad to hear they’re worth a couple paws up from you guys! Will definitely get my hands on those for Avery since you recommend ’em! I think so too! So glad Avery likes it! I think that might drive Brother Simon crazy, buy it’s a short trip MOL! Avery, did you know that she called you LAZY all over the interwebs?!? LOL! I wouldn’t have thought about this toy at all, but now I’m thinking about it! Thanks! 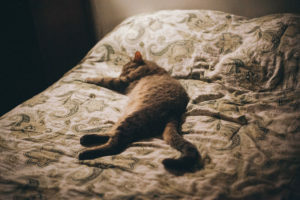 Every day this cat comes up with new ways to save energy – he should be studied, that’s how lazy he is 😉 Pushing the boundaries with regards to how little he can really do! hahaha. Let me know if you give it a shot! Always curious to know how other cats respond to the same cat toys! 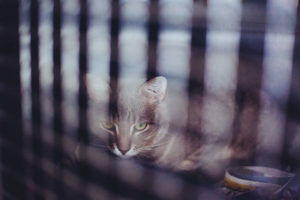 Moved with Cat to a Smaller Apartment: Now He Hisses; Advice?